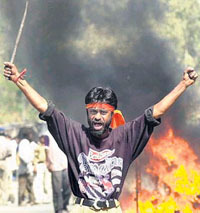 A decade after 23 persons, including 18 women and children, were burnt alive by a mob in Gujarat's Ode village in this district during the post-Godhra riots, a court here today convicted 23 accused and let off as many in a case it described as "rarest of rare". 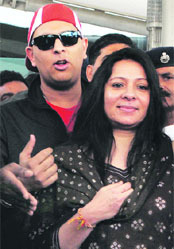 District and Sessions Judge Poonam Singh held 23 of the 47 accused guilty. On a day when Narendra Modi-baiters were celebrating the result of an online poll by an international magazine in which the BJP leader got more �no� votes than �yes� on whether or not he should be included in the list of 100 most influential people, the BJP credited his government for the conviction of 23 persons in the Ode killing case. 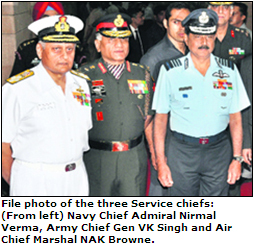 Worried over defence preparedness and the country�s war fighting abilities, the Parliamentary Standing Committee on Defence today summoned the Service chiefs of the armed forces � Army Chief Gen VK Singh, Air Chief Marshal NAK Browne and Navy Chief Admiral Nirmal Verma � to appear before it on April 20 and explain if the forces are battle-ready. India and Pakistan are discussing the dates when the Home/Interior secretaries of the two countries could meet to take up terrorism and other security related issues as part of the dialogue process between the two countries. The sudden visit of President Asif Ali Zardari and his son Bilawal to India has invited ire from their political opponents in Pakistan with cricketer-turned-politician Imran Khan questioning the timing of the tour, when the country was faced with a tragedy of the 139 soldiers missing in avalanche in Siachen glacier. Charles Maurice de Talleyrand was the greatest French diplomat of the 18th and 19th centuries. His advice to budding diplomats was, �Surtout, messieurs, point de zele� (Above all, gentlemen, not the slightest zeal). Similarly, we should resist zeal, especially in our dealings with Pakistan.